Choosing a university to complete your education is an important personal and financial decision. 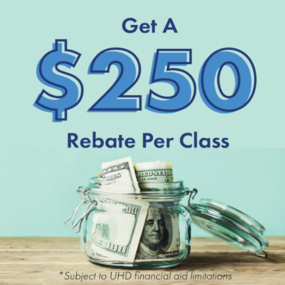 Marilyn Davies College of Business wants to help make the choice to transfer to UHD and complete your Bachelor of Business Administration (BBA) easier by offering community college students a little financial relief for Spring 2019. Students finishing their last semester or final courses at their respective community college can apply, be admitted and begin taking business classes at University of Houston-Downtown while completing their Associates (AA/AS) degree. This is called Dual Enrollment, when you are enrolled at community college taking courses and you’re also enrolled at UHD taking business courses, concurrently. The first step is to apply for admission to UHD. Each student’s next steps will be different so after your application is submitted, contact the College of Business advising office to talk with an advisor about admission into the College and receiving the $250 per business class tuition rebate for Spring 2019. Live Chat with College of Business advisors here.